Enter the door of Chef Brian Lewis' new restaurant, The Cottage in Westport, Connecticut and the first thing that you notice is that the space is at once intimate and cozy, stylish yet comfortable, like the charming shoreline town of Westport founded in 1835 where it resides. 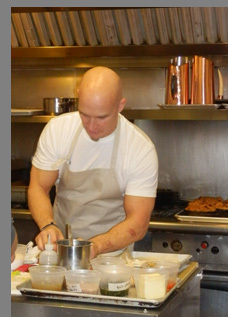 A graduate of The Culinary Institute of America, Chef Brian Lewis focuses on inspired classical cuisine interspersed with exotic ingredients and picture perfect presentations to dazzle the eye as well as the palate. 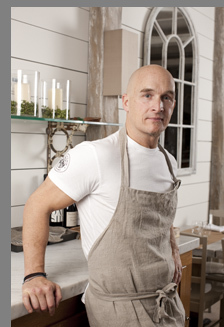 We first became acquainted with Chef Brian Lewis when he launched the restaurant elm in New Canaan, Connecticut a few years ago and immediately became fans of his culinary vision and culinary artistry. 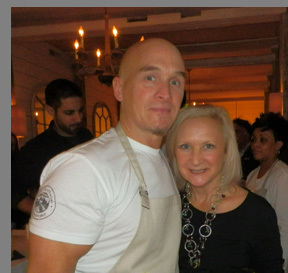 When he opened The Cottage in Westport, Connecticut in early December 2015 we were there to celebrate the opening of his newest endeavor, and returned to have dinner at the restaurant in early January 2016. 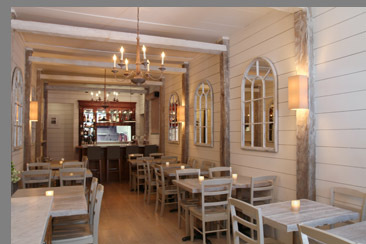 The ambience is stylish and simplistic with its light wood floor, arched mirrored "windows" grace the light wood walls, craft paper covers distressed wood tables accessorized with votive candles, colonial-type "candle" chandeliers and sconces provide soft lighting, and cool music sets the mood for dining and the gathering of family and friends. Four stools at the small bar area provide the perfect spot for "chef watching" into the open kitchen or for pre or post dinner drinks. The Cottage may be small in size, but is large on talent, beginning with Chef Brian Lewis who has an impressive culinary history, and extends to his professional, knowledgeable, and enthusiastic team that bring a creative spirit and excellent service to the guest experience. The restaurant has a nice selection of wines by the bottle as well as by the glass, signature cocktails, and craft brewery beers. We began our evening with two of the tempting cocktails on the menu, the Calvados Sidecar and the French 256, a play on the classic cocktail the French 75, with 256 referencing the address of the restaurant. Mixologist Adam Coale brings his talent as a former chef and catering company owner to the bar with his creative cocktail recipes that are a perfect complement to Chef Brian's innovative cuisine. His very tasty take on the French 75, (normally made with gin, champagne, lemon and sugar) was made with Barr Hill Gin, house made infused sage and lemon verbena syrup, and "bubbles" (sparkling wine), with a long twist of lemon peel that was first rubbed over the rim of the flute to impart the lemon oil and then put inside the drink. The combination of his use of "kitchen" elements, sage, lemon verbena, vanilla and cardamom into his cocktail creations were not only delicious, they added another layer of sophisticated flavors to intrigue the palate. 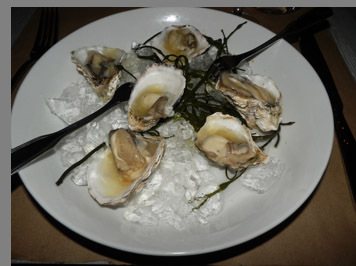 To begin our dining experience, (Debra) had a half-dozen of the Kusshi Oysters dressed with a yuzu ginger mignonette presented on a crushed bed of ice garnished with sea weed that was absolute perfection. For those not familiar with this type of oyster, they are small, very plump, with light salinity and an ultra-clean finish that was well complemented with the light yuzu ginger mignonette to intrigue but not overwhelm the palate. Paired with the French 256, the evening was off to a great start. 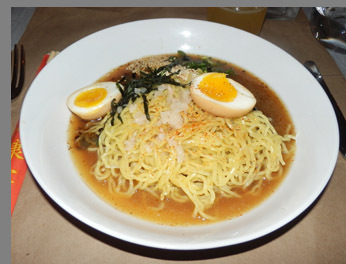 When we learned that Chef Brian Lewis makes his own ramen noodles for the Tonkotso Ramen with chasu pork belly, fermented black garlic and soft egg, (Edward) decided to have this as a first course. This was a stunning presentation of style and taste with enticing aromas wafting in the air announcing its presence before Chef Brian placed the bowl on the table and then poured the rich and fragrant broth around the noodles. The Calvados Sidecar was another well-crafted, balanced cocktail presented as a blend of Calvados, Grand Marnier, lemon and a vanilla cardamom sugar rim that was well paired with the Tonkotso Ramen. One of Chef Brian's new signatures is his Wagyu Brisket Steam Bun with Napa kimchi, duck fat potato tempura and accompanying sauces. 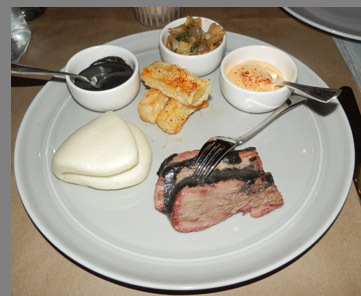 (Edward) ordered one of the buns and the marinated sliced 3-day slow cooked brisket almost melted in your mouth. Accompanied by the spicy kimchi and complementing sauces, you could build your steam bun according to your preference. Also nice were the rectangular shaped duck fat potato tempura, with their opposing textures of crispy exteriors and creamy interiors. We paired our main courses with another one of the signature cocktails, the Emerald Dragon made with house infused green tea vodka, yuzu, Meyer lemon, and ginger, which was a perfect match with the White Miso Buttered Lobster with carrot, ginger, and kohlrabi, and the Duck Fried Rice with maitake mushrooms, bok choy, and sunny egg. 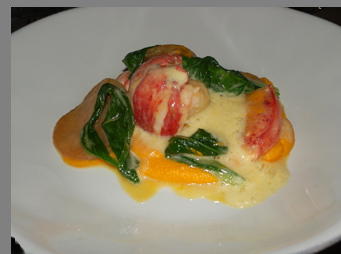 The White Miso Buttered Lobster with carrot, ginger, and kohlrabi, was another example of culinary artistry, visually attractive to catch the eye, lovely aromas to delight the sense of smell, and intriguing flavors and textures to satisfy the palate. The lobster was presented on a bed of pureed carrot and ginger with thinly sliced kohlrabi to add texture and kohlrabi greens to add a punch of color and add a slight bitterness to the sweet carrot ginger mixture. What we have learned from past experiences with Chef Brian Lewis is that he will always surprise you in an outstanding way, and the description on the menu of Duck Fried Rice - maitake mushrooms - bok choy - sunny egg, was a perfect example of understatement. 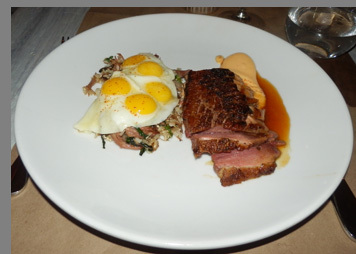 For this recipe Chef Brian presented sliced duck alongside fried rice with duck confit, maitake mushrooms (also known as Hen-in-the-wood mushrooms), and bok choy topped with 4 sunny side up quail eggs. 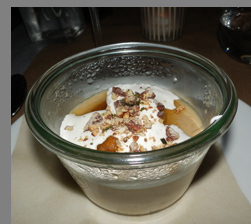 The presentation was gorgeous followed by sighs of pleasure on the palate. 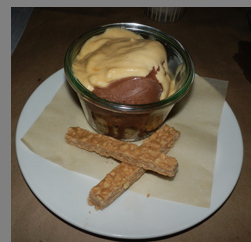 To finish a perfect savory start we had two of the desserts, the Peanut Butter and Chocolate Ice Cream Crunch accompanied by two rectangular peanut butter cookies, and Bananas Foster Pudding with Cream, both of which were richly satisfying and a delightful culmination of dining at The Cottage. The Cottage is open Tuesday through Thursday from 5:30pm until 9:30pm, Friday and Saturday from 5:30pm until 10:30pm, and for Sunday Brunch from 11:30 am until 2:30 pm, for Supper on Sunday from 5:30 pm until 9:00 pm. © January 2016. Luxury Experience. www.LuxuryExperience.com All rights reserved.